The University’s Ka Yee Lee and Luka Pocivavsek examine wrinkling in a polyester thin film supported on a gel. Lee, Pocivavsek and their associates study the characteristics of lung surfactant, a microscopically thin membrane that facilitates breathing. A sojourn to a distant land provided Luka Pocivavsek with the shortcut he needed to help solve a major problem in his research. As an M.D./Ph.D. student at the University, Pocivavsek has focused his research on understanding the behavior of lung surfactant, a microscopically thin biological membrane that facilitates breathing. Along with associates here and at the University of Santiago in Chile, he has explained, for the first time, the physics that governs how thin materials at scales thousands of times different in thickness make the transition from wrinkles to folds under compression. But the findings, published in the May 16 issue of Science, also would apply to the design of foldable electronics and to the production of synthetic lung surfactant for therapeutic uses. “Our paper is getting at the generality of these transitions,” Pocivavsek said. His Science co-authors include Ka Yee Lee, Associate Professor in Chemistry and the College; Binhua Lin, Senior Research Associate in the Center for Advanced Radiation Sources; and Enrique Cerda, associate professor of physics at the University of Santiago. Also contributing to the study were three summer researchers: Sebastián Johnson, an undergraduate exchange student from the University of Santiago; Andrew Kern, a 2007 graduate of the University Laboratory Schools, now at Northwestern University; and Robert Dellsey of Tulane University. The chief lipid component of lung surfactant is called dipalmitoylphosphatidylcholine, or DPPC. Pocivavsek likened DPPC in its purest form to a porcelain plate. “If you push on it hard enough, it’s going to crack,” he said. If lung surfactant consisted of 100 percent DPPC, the cracked pieces would hold together under the pressure during exhalation. But the plate would fall apart upon inhalation, which would decrease the stress. But thanks to the Chicago-Chile Inter-American Materials Collaboration, funded by the National Science Foundation, Pocivavsek began a new line of related experiments on wrinkling and folding in a much thicker polyester film to get insights into the wrinkling-to-folding transition. At 10 microns thick—narrower than a hair—the polyester film is thick enough to see with the naked eye. During 2006, Pocivavsek spent several months at the University of Santiago working with Enrique Cerda, the theoretical collaborator of the project, to explore the response of polyester films when put under stress. Upon his return to Chicago, Pocivavsek continued the experiment in Lee’s laboratory with summer students Johnson and Kern. Together, they were able to precisely measure the wrinkles and folds in the polyester film. Meanwhile, at CARS, Binhua Lin used light microscopy and X-ray techniques to measure wrinkling and folding in three layers of gold nanoparticles measuring only 15 nanometers in thickness. 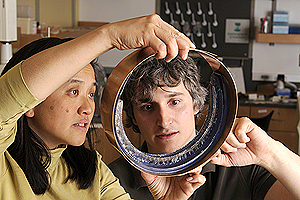 Working with Pocivavsek and Dellsy, Lin’s experiments provided data on a third type of material at yet another length scale. The collaboration was further enhanced by Cerda’s visit last summer to Chicago. These experiments enabled the group to verify Cerda’s theoretical calculations about how a thin supported elastic film, such as a lung surfactant monolayer, behaves and document the universal dynamics of wrinkling and folding over a vast range of length scales in different materials. When first compressed, an elastic material begins to wrinkle. The stress then focuses at a certain point, causing a trough or a peak to grow. Lung surfactant has the ability to reverse this stress, allowing the folding that occurs on exhalation to smoothly stretch back into its previous flat state with inhalation. A crumpled piece of paper shows ridges when flattened out again because there is nowhere for the focused energy to escape. Not so with a membrane stretched over a reservoir, where the fluid underneath the membrane will absorb the energy, preventing ridge formation. The principle has technological as well as biomedical implications. And in the biomedical arena, researchers may be able to develop a therapy for sufferers of Respiratory Distress Syndrome that mimics the physical properties, rather than the chemical composition, of natural lung surfactant. “We might not necessarily have to use the particular lung surfactant components that nature uses,” Pocivavsek said. In addition to the NSF, support for Lee and Pocivavsek’s research comes from the U.S.-Israel Binational Foundation, the University’s Medical Scientist Training Program, the Dreyfus Foundation, the March of Dimes and the U.S. Department of Energy.